Those travellers who decide to rent a car during their holiday in Tenerife will soon discover that this Canary Island offers a lot more than nice weather and beach resorts. The diversity of landscapes makes driving in Tenerife a truly unique experience. Wondrous volcanic rock formations, semi-deserted plains, dramatic cliff coast, clouds-covered mountain peaks, winding roads in forests of lush vegetation – the list of possible settings for Tenerife road trips is long. Tenerife car hire is widely accessible and inexpensive, especially if booked well in advanced. Before the main holiday season, use an internet search engine, such as Cartrawler, to find cheap car hire offers in many convenient locations in Tenerife. Compare car rental in Tenerife Airport South or Tenerife Airport North. Tenerife’s Teide National Park, a UNESCO Biosphere Reserve, is the most visited nature park in the whole of Spain. A drive through the park allows to appreciate Tenerife’s unique landscapes. The surreal volcanic scenery of Teide Park and its vast, untouched by man areas, served as the filming location for the box office hits “Planet of the Apes” and “Clash of the Titans”. Bring a camera with you as the views in Teide Park are truly stunning. The landscape is dominated by the imposing Mount Teide, a volcano and the highest mountain is Spain. From the upper sections of the park you will be able to get good shots of Tenerife’s coast and, with clear weather, also get a glimpse of other islands of the archipelago, Gran Canária and La Palma. The roads in Teide Park are good and a standard Tenerife rental car is fully sufficient to drive through the park. Teide Park is an excellent place to combine scenic drives with stunning hiking. 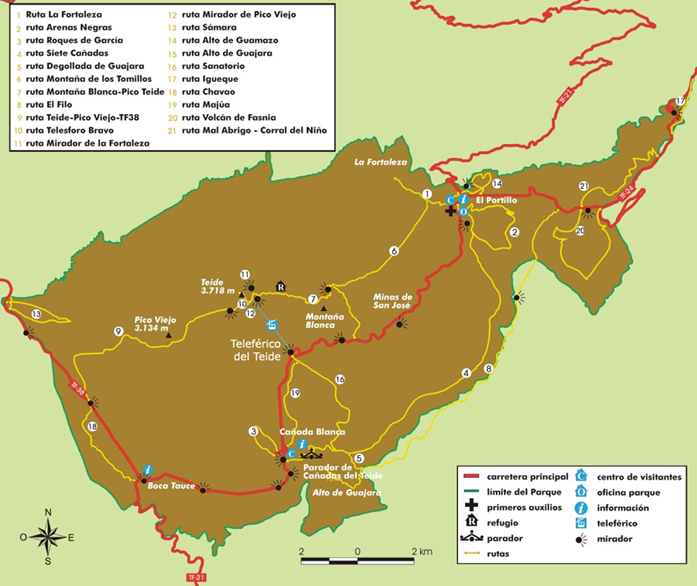 See the map of Teide Park in Tenerife (Roads marked in red, hiking trails in yellow). When looking at the best Tenerife drives, you may get the impression that every road tripper in Tenerife is going to Masca. What is so fascinating in a 100 inhabitants mountain village sustained by wheat and potato farming? Masca is a very picturesque location, mostly because of its surroundings and natural resources. Several species of wild flowers as well as the Canary island wild date palm grow here. Other than that, the village boast a small church and a plaza with some choice of restaurants and cafes. What really attracts adventurous holiday-makers in Tenerife to this secluded location is the already legendary road to Masca. It wasn’t until the 1960’s when the road access to the village was for the first time created. Nowadays, the road to Masca, known in Tenerife as carretera TF-436, is still a narrow, winding passage with countless sharp bends and spectacular views of the mountains. The route to Masca from Santiago del Teide is a challenging drive on most of it roughly 3 miles distance. A lot of attention and focusing on the steering is required as it zigzags up and down the hills with very few straight-line drive sections. Curiously enough, the road to Masca has one of the lowest rates of accidents in the whole Tenerife, mostly because the very sight of it - a thin, winding line, among the imposing mountains, inspires respect. Not to mention, does not allow great speed. Tenerife public transportation covers the route to Masca. Also private tour companies offer organised trips to the village, either in small tour busses or as, very popular in Tenerife, jeep safaris. If you are planning to rent a car in Tenerife, a four wheel drive is not a must for driving on the road to Masca. However, a 4x4 a Tenerife hire car will give you an incomparable pleasure and comfort of driving on mountain trails of Tenerife. If booked well in advance of your stay on the island, the cheapest four wheel drive, in a form of a Toyota Rav4, or a similar SUV, will have prices starting from around £ 220 for a week of Tenerife 4x4 car hire. A popular starting point for many roadtrips in northern Tenerife is La Orotava. Nestled in a picturesque valley of the same name, the town of La Orotava is one of the oldest in Tenerife and the most beautiful ones. In the past La Orotava was the favourite Tenerife location for Spanish nobility. La Orotava´s past glory and wealth is still visible in many well preserved Renaissance palaces, mansions, churches and convents. La Orotava´s most iconic tourist attraction is La Casa de Los Balcones. Built in 17th century and recognizable for its many balconies and inner patio, La Casa de Los Balcones is not only an unique example of Spanish architecture, but also a monument to Canarian folklore. Here you can see and buy typical Tenerife ceramics and embroidery and also visit a folk museum dedicated to preservation of those traditional crafts. Find out more about Casa de Los Balcones in Tenerife. Today, La Orotava remains a very quaint location, a bit apart from Tenerife mainstream tourism. The town’s main streets are lined with elegant restaurants, cafes and brand boutiques and the public gardens and green areas are exceptionally well maintained. La Orotava Botanical Garden boasting exotic flowers and trees from all over the world is a perfect location for a family outing during at Tenerife. Should you be visiting Tenerife in June, do not miss out on the festivities of Dia de Los Alfombras ( Day of the Carpets), taking place 8 days after the Corpus Cristi celebrations. On that day the streets of La Orotava are elaborately adorned in flower carpets becoming a real visual, yet not lasting, masterpiece. Read more on La Orotava Flower Carpets. La Orotava is situated very close to the popular holiday resorts of northern Tenerife. The driving distance to Orotava from Puerto de La Cruz is of around 4 miles by the winding mountain roads set in the green scenery of banana plantations. The distance from La Orotava to the pretty coastal village of Garachico is approximately 18 miles (30 km) by the coastal TF-5 motorway. Los Realejos. This picturesque mountain village, in about 6 miles distance from La Orotava, is well worth a detour from the TF-342 road. Be prepared though, that the mountain road to Los Realejos can be quite steep and quite a challenging drive, at times. Here, a Tenerife 4x4 hire car can be put to a good use. La Corona Forest Natural Park. Back to TF-342, you will have opportunity to admire pine forest landscapes of La Corona Forest Park, the island’s “green lung”. La Corona is one of Tenerife hikers’ favourite locations. At the La Coronal view point, one of the most popular in Tenerife, you can take in the stunning sights of the area. La Pinaleta. If you are travelling with children, look for La Pinaleta, near La Guancha town, some 13 miles from La Orotava. With its playground, picnic area and child-friendly eateries, La Pinhaleta is a perfect place for a short stop in your day trip to Garachico. Garachico itself is a charming little town with quite an interesting tourist offer. Reserve some time to visit its secluded beaches, historic sites picturesquely set in lush vegetation, public gardens and the town’s plaza with local sea food restaurants. Car hire is widely accessible in Tenerife. Get to know the best Tenerife scenic drives: the road to Masca, Teide National Park and coastal roads of Northern Tenerife. Compare 4x4 hire in Tenerife Cartrawler.